Looking for a 'Brief Encounter'? Our Burton M6 Northbound hotel, on the edge of the stunning Arnside and Silverdale AONB is a short drive from Carnforth, the iconic filming location for one of the most romantic movies of all time. Visit Leighton Hall and the Leighton Moss RSPB Nature Reserve, the location for BBC's Autumnwatch. We're an ideal base for jaunts into the Lake District, Yorkshire Dales and the Forest of Bowland with Kendal, Kirby Lonsdale and Lancaster all close by. This hotel has upgraded rooms that feature a comfy king size bed with four plump pillows and a cosy duvet. Guests can enjoy a variety of food and drink choices within easy walking distance from this hotel. At The George Washington, enjoy a satisfying meal at the restaurant. Wrap up your day with a drink at the bar/lounge. Breakfast is available for a fee. At Longlands Inn and Restaurant, enjoy a satisfying meal at the restaurant. Need to unwind? Take a break with a tasty beverage at one of the 2 bars/lounges. Full breakfasts are available daily from 8:30 AM to 9:30 AM for a fee. At The Royal Station Hotel, enjoy a satisfying meal at the restaurant. Quench your thirst with your favorite drink at the bar/lounge. English breakfasts are served on weekdays from 7:30 AM to 10 AM and on weekends from 7:30 AM to 10:30 AM for a fee. Located in Carnforth, Hutton House Bed and Breakfast is within a 5-minute drive of Cinderbarrow Miniature Railway and Lakeland Wildlife Oasis Park. This 4-star bed & breakfast is 6.8 mi (11 km) from Lake District and 10.6 mi (17 km) from Yorkshire Dales National Park. Lancashire is known principally for its famous history, industrial heritage and stunning landscapes. Situated at the northern tip of this historic county, Carnforth boasts nature and countryside activities in abundance, as well as various opportunities to sample the local culture. This hidden gem is the ideal choice for families looking to get away from it all. Nature lovers will find much to enjoy around Carnforth. Sitting at the north-east corner of Morecambe Bay, the town is just a few minutes' drive from the Leighton Moss Nature Reserve. Called home by everything from bats to otters, along with a wide range of birds, it was the site of the BBC's Autumnwatch programme in 2014. If you're lucky, you may even spot one of the resident red deer. The Greenlands Farm Village offers a great family day out, with the opportunity to get up close to a variety of farm animals. It also has a pottery studio, farm shop and mini golf. If you fancy a hike along one of Carnforth's many surrounding trails, Warton Crag comes highly recommended. Overlooking the town, this limestone peak offers stunning views from the top, as well as being close to the region's canal network. If Carnforth's quaint railway station looks familiar to you, it's because it occupies a special place in cinema. This iconic platform provided the setting for none other than David Lean's 1945 classic Brief Encounter – arguably one of the greatest romance movies of all time. Fans of the film will be able to re-enact their favourite scenes in the Brief Encounter Refreshment Room, while the accompanying Heritage Centre provides an overview of the station's history. Leighton Hall is the traditional home of the Gillow family. Set in the idyllic Lancashire countryside, this opulent house has much to offer, and not just in terms of its architecture and history. Bird of prey displays, kids' play areas and tearooms are all part of the package, with special events such as classic car shows throughout the year. Fine dining and decent pub grub are equally provided for in Carnforth. The Catch 23 restaurant on Kellet Lane, for example, offers a variety of excellent fare in a cosy environment, without going overboard on price. The Eagle's Head offers hearty portions and pub favourites. 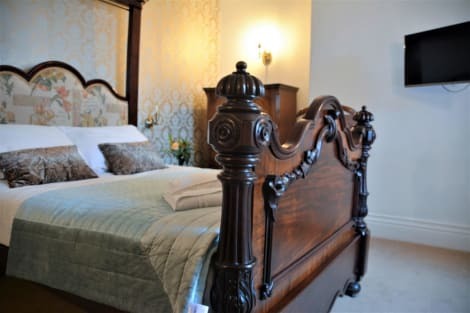 When it comes to choosing where to stay, there are a variety of Carnforth hotels on offer – not least the County Hotel, which provides a tranquil atmosphere from which to explore the local area.